Mustafa Kemal was born in Salonika in 1881.He attended primary school at the Şemsi Efendi School in Salonika. He continued his education at the Salonika Military Middle School and the Monastir (Bitola) Military Preparatory School. He graduated from Istanbul War College in 1902 and completed his education at the War Academy in 1905. He had several duties in the armies. In 1913 he was in Sofia as the military attaché. He participated in the Balkan War with the rank of major in 1912 and1913 and served in the army corps which recaptured Edirne from Bulgaria. In 1915, during the World War I, he fought in the Çanakkale (Dardanelles) Battle as the 19th Division Commander. He was appointed as the Army Corps Commander to the Eastern Front in 1916 and rose to the rank of Brigadier General. He stopped the Russian attacks and recaptured Bingöl and Muş from the enemy. In 1917 he was appointed to the 7th Army Command that was in charge of Palestine and Syria. Upon the occupation of the country by the Allied Forces on the basis of the Treaty of Sevres, he arrived in Samsun on 19 May 1919 via the Black Sea and initiated Turkish national struggle. Mustafa Kemal issued the Amasya Circular on 22 June 1919 in which he announced the Turkish Nation that “the integrity of the country and the independence of the nation are in danger and a congress will be convened in Sivas in order to save the country with determination and decisiveness.” Mustafa Kemal chaired the conventions held in Erzurum and Sivas on 23 July 1919 and 4 September 1919 respectively. 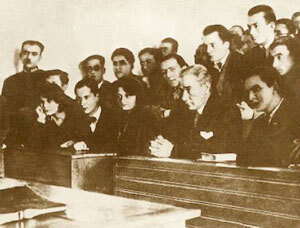 He resigned from his military post; and on 23 April 1920 the Turkish Grand National Assembly (TBMM) convened for the first time on in Ankara. He was elected as the head of the parliament. He fight against the advancement of the Greek army by taking charge as the Commander-in-Chief. He won the Sakarya Battle. On 19 September 1921 he was promoted to the rank of “Marshal” and given the title of “Gazi” (war veteran) by the TBMM due to this victory. The Turkish Army started to counter-attack the Allied Forces on 26 August 1922 to end the enemy occupation completely. The Greek Army was largely defeated under the command of Mustafa Kemal in the Battle of the Commander-in-Chief (30 August 1922). After the salvation of the Anatolia, the sultanate and sultanate and caliphate were abolished. He was elected as the president on 11 August 1923 after the Treaty of Lausanne. He was elected as the president of the Republican People’s Party on 9 September 1923. Mustafa Kemal was elected as the first President of the new Republic on 29 October 1923 when the republic was proclaimed. Until he passed away in 1938, Mustafa Kemal Atatürk served as the President of Turkey which makes him the only person to hold this distinguished post for the longest period. He was elected to the Presidency for four consecutive terms. Atatürk was not only a commander-in-chief who led the War of Independence successfully, but also a genius statesman given the reforms that he realized. During most of his 57 year-long life, Atatürk tirelessly worked for the happiness of the nation and the independence of the country and he emerged victorious from every battle he fought. The founder of the Republic of Turkey and unforgettable and brave leader passed away in Istanbul on 10 November 1938. Until that day and since that day he was and is the symbol of the struggle and peace for whole world.